Ahh… The first day of October. Bring out the Fall decorations, the pumpkin spice beverages, pumpkin bread, Halloween candy and Oktoberfest! 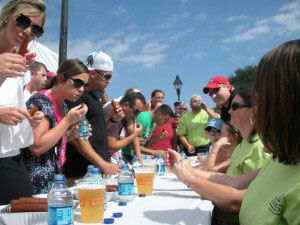 Oktoberfest on River Street is October 4th through October 6th this year. We are delighted to announce that we will be participating in this Fall festive event! 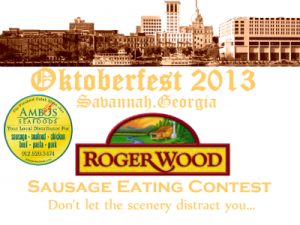 Along with Ambos Seafood, we are conducting the annual Sausage Eating Contest Saturday, October 5th at 3:30 p.m.
Do you have what it takes to eat as many Roger Wood sausages as you can in a small allotted time? It’s the challenge we are presenting to you! We’ve had the same winner the past two years. Do you think you can beat him? There will be 1st, 2nd and 3rd Place Winners. The 1st Place Winner is awarded a CASH PRIZE. 2nd and 3rd Place Winners receive a goodie bag of prizes. 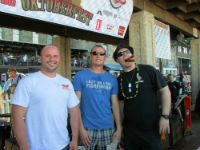 We had a great time at the Sausage Eating Contest for Oktoberfest on River Street! Our first place winner was Corey Fisher from Charlotte, NC. 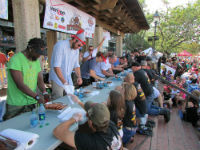 He ate a total of 16 1/2 Roger Wood sausages in under 5 minutes. Our second place winner was Travis. And, our third place winner was our previous 2 year reigning champion, Arthur. Thanks to everyone who helped put the event on and to all who participated! 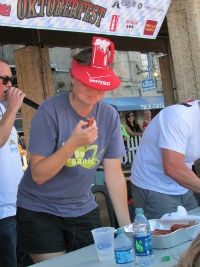 If we had a favorite shirt prize, it would have gone to the lovely lady wearing a “Go Organic” shirt while throwing down in the sausage eating contest.